Have you noticed how delish the peaches and apricots are right now? I’m not sure who is devouring more of them in my house and this makes me very happy. Not one to let a reason to celebrate go by unnoticed, my Sunday Supper Family is throwing a virtual peach party this week in anticipation of National Peach Month in August. It’s also National Peach Ice Cream Day today….how are you celebrating? 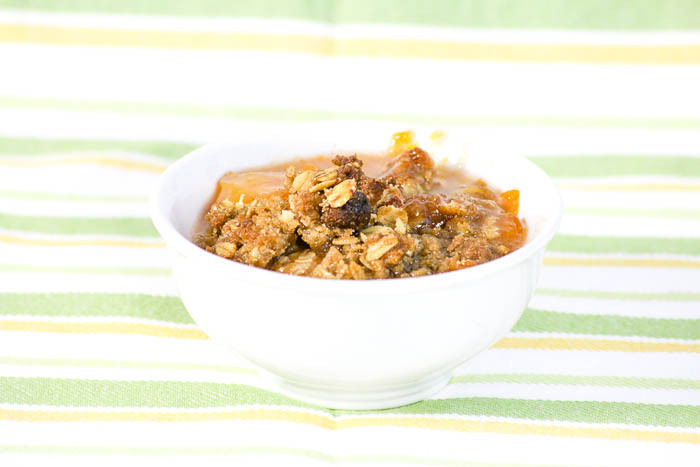 I’m getting my party started with Gluten Free Peach Apricot Crisp. I am not known for my gluten free baking but I was inspired when I was messaging the king of gluten free, my friend T.R. from Gluten Free Crumbley. It wasn’t anything specific that T.R. wrote but, rather, I realized that I could easily make this recipe gluten free which meant that more people would be able to enjoy it. Fortunately, I had gluten free oats and gluten free oat flour on hand because I had just finished making a batch of Happylicious by Betsy‘s gluten free oatmeal raisin cookie dough balls. The rest is just a matter of mixing ingredients together and baking. One fabulous thing about working with peaches and apricots is that they do not have to be peeled before baking. WOOHOO! Preheat the oven to 350º. Set aside an 11" x 7½" baking pan. Cut the peaches and apricots into medium size pieces and place into a bowl. Add the sugar, gluten free oat flour and cinnamon. Stir to combine and transfer to the baking pan. Stir together the gluten free oats, gluten free oat flour, brown sugar, sugar, cinnamon and salt in a medium size bowl. Use your fingers or a fork to blend the butter into the mixture, just until it is incorporated but not blended. Place the baking pan onto a baking sheet and bake at 350º for 1 hour, rotating the pan front to back halfway through. Remove from the oven and cool. Serve warm or cold. Now it’s time to really get this party started. Many thanks to Sue Lau from A Palatable Pastime for hosting this week’s event. 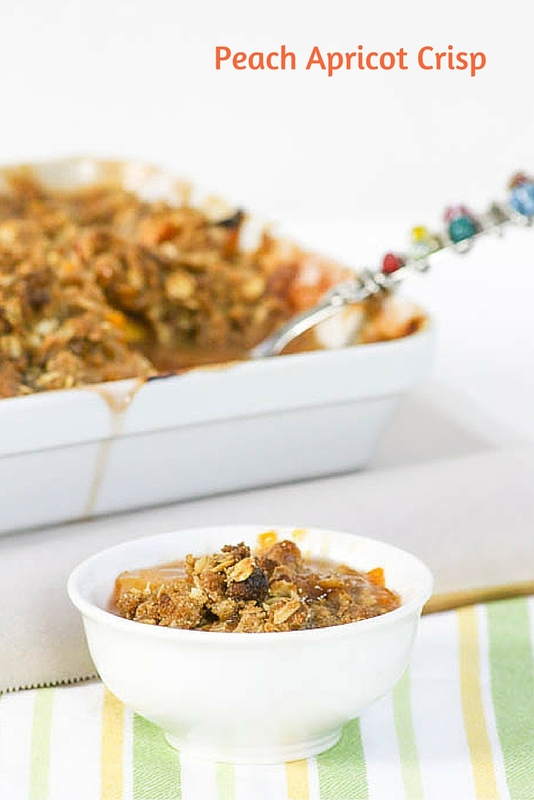 Be sure to check out the other wonderful peach recipes from my Sunday Supper Family! I’m jealous of your fresh apricots! This sounds like the most amazing combination!!! Fabulous crisps, Betsy!!! What a perfect dessert to turn gluten free! It looks delicious. Thank you. I must say that it was a breeze to make this gluten free and I am so glad I did! I love making my crisps gluten free with oats and oat flour and I even use olive oil a lot. It makes them a little healthier too. This looks divine! Great idea to use olive oil! 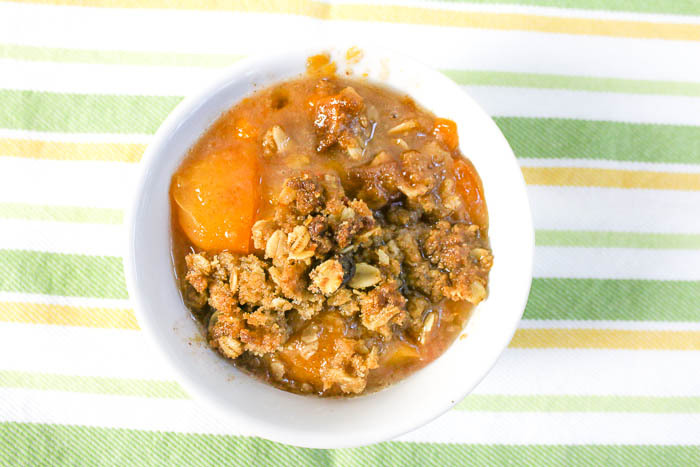 I love oat-topped crumbles/crisps and your peach and apricot version sounds amazing! Thanks so much, Caroline. 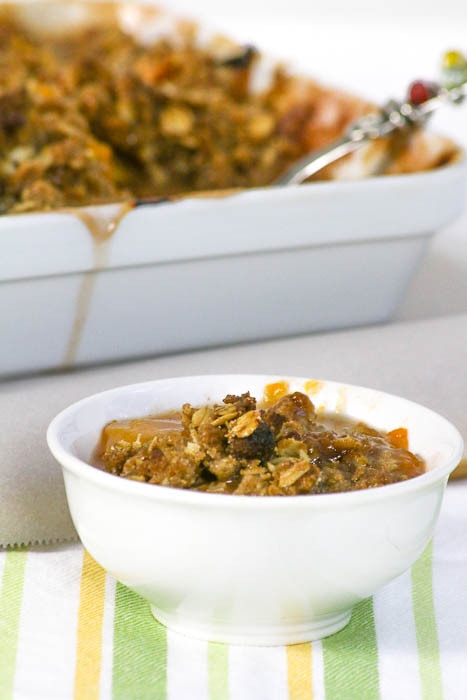 Oats add such great flavor and texture! I love using oats as a crumb topping. The peach and apricots combination sounds fabulous. Apricots and peaches sound wonderful in here!